Harare looks beautiful in October with the jacaranda trees in bloom. Purple blossom against deep blue skies, floating down onto the dusty red earth. It’s the end of the dry season. The rains will come in November but for now it’s hot and arid, the way I remember Zimbabwe since my year living here in 1992 was a year of drought. It’s 21 years since l left Zimbabwe and everything has changed yet stayed the same. During that time Zimbabwe has gone from being known as the bread basket of Africa to being an economic basket-case. At the height of its troubles inflation spiraled out of control, a loaf of bread literally cost trillions of Zimbabwe dollars and food was scarce. Now the Zimbabwean dollar has been discontinued and the US dollar is used everywhere. The Zimbabwe government has stabilized and, with a new coalition government in place, hopes are high for a brighter future. Adventure loving tourists and travelers who stayed away are for years are coming to visit again because Zimbabwe is one of the best places in Africa for wildlife, culture and natural beauty. But with the worst of its problems of the past Zimbabwe still has a bad reputation that it doesn’t deserve. Even though I know and love Zimbabwe I was worried about coming here because of the bad press I read on the Internet before leaving. Maybe you’ve heard bad things about Zimbabwe too so let’s bust a few myths about travel to Zimbabwe because I just got back from 10 days there and I felt safe and very welcome during my entire visit. Big press agencies thrive on selling sensationalized stories but this is just a simple on the ground report from a solo woman traveler who visited Zimbabwe in October 2013. Don’t just take my word for it though. I fully recommend that you visit Zimbabwe and decide for yourself. Just be warned – you might end up falling in love with Zimbabwe like I did. I got up early every morning and out of my hotel room at 6am or 7am to walk the city streets. There’s a lot of rubbish around Harare and the pavements are in a state of disrepair but as long as you keep your eyes to the ground to avoid falling in a pothole it’s perfectly safe. Zimbabweans are respectful people. Most don’t blink an eye at the sight of a lone European woman wandering the streets of Harare. A few call out “Hello Madam!” but no one bothered me and when I got lost and asked for directions everyone was super helpful. Whoever started this myth has obviously never traveled around Zimbabwe. As mentioned above, despite my pallid complexion, I only met friendly, welcoming people who seem genuinely happy to see me during this visit to Zimbabwe. I did get called “white legs” by a policeman but he was harmless enough, just wanting to talk and looking for a small bribe. I spoken to hundreds of people on the street in Harare and he was only person that asked me for money. Most were happy to chat and let me take their photo. There are pockets of racism in every country. Australia is often called a racist country but it’s not a reputation which Zimbabwe deserves. They do and there are plenty of ATM machines in Harare city center, many with security guards outside to make sure your transactions are safe. If you wonder why that’s quite common in developing countries or anywhere where labor is more affordable and reliable than expensive security cameras. I traveled by taxi or private car late at night twice. Rumors abound on the Internet about car-jackings but locals tell me they are very rare. I made sure all the car doors were locked just in case. The general consensus is that Zimbabwe is a far far safer country than Kenya or South Africa. Even Kenyans and South Africans who I met in Zimbabwe agree on that. I visited two high density areas, Kambuzuma where my former pupil Sunwell (read about Sunwell here) lives and Mbare which is the oldest township in Harare and home to the biggest market and bus station in Zimbabwe. It’s confronting visiting these areas because of the poverty and being the only European means you get a lot of attention which can be intimidating if you’re not used to it but it is safe. As in busy places anywhere from London to Lusaka petty thieves are around so if you visit high density areas hide your valuables and money under your clothes where they can’t be seen. I recommend you go with a local too and I found a great Mbare Tour company which I’ll write about another time. So what’s the true story about travel to Zimbabwe? The people were friendly everywhere I went and I’ve got some amazing photos. I can’t wait to show you. As well as spending time in Harare I took a charter flight to Mana Pools National Park for a walk on the wild-side in one of Africa’s last true wilderness areas. That was a different type of safari but equally memorable. So that’s my true story about travel in Zimbabwe in 2013. Zimbabwe has hit the headlines for all the wrong reasons since I last visited but it’s still one of my favorite destinations: the magical light, bright colors, rich heritage, diverse creativity and friendly people are still there. Zimbabwe has always been one of my favorite travel destinations and it still is. The biggest problem Zimbabwe has is an image problem but don’t trust everything you read in the press or see on TV. Visit Zimbabwe for yourself to see what a safe, welcoming and beautiful place it is. Have you got any travel safety tips? I was a guest of Zimbabwe Tourism Authority during my stay in Zimbabwe. I can’t wait to share more stories and photos from Zimbabwe with you soon. This is exercise #42 of the 52 Exercises Quest. The next episode will be a game walk in Mana Pools National Park. Terrific Annabel, I’ve been so looking forward to reading your posts and learning about Zimbabwe from a trusted source. Love the photos and really looking forward to hearing more from you. I’ve so been looking forward to your stories, and I am glad and relieved that your impressions of Zim were positive because as you say that’s not the vision put forward by the popular press. I’m also really looking forward to vicariously living the trip through your eyes, as I was gutted not being able to go too. And thirdly, Africa will never leave my heart, it runs through my veins and always will, so I can’t wait to see pics and hear tales of derring do and adventure from you:). A really interesting post and I loved the picture of the jacaranda trees, so many wonderful memories. I have friends still living in Zim and I have to agree that they say security is not a problem. I email one on a regular basis and they are still very happy there. Johanna is right, once you have lived in Africa it will always stay in your heart and in your blood. Having lived in both Rhodesia (before Zim) and South Africa, the former is the one with all the greatest memories. I met several Zimbabweans both white and black who have British or Australian passports but prefer to live in Zimbabwe. It’s an amazing lifestyle. What a great piece. I love it when negative myths are busted. Thanks for posting this. 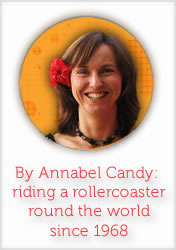 Hi Annabel, thanks for this awesome post. Funnily enough I live in Harare myself. I found out about you from a mixergy interview you did with Andrew Warner. I went straight to your site and am in awe of how easy and enjoyable it is to read whatever you’ve written. Usually I have little patience and skip through articles, but I’ve found myself reading the next sentence and the next one and so on. I interact with a lot of backpackers and travelers to know that… sadly, a few people do have their wallets and other valuables stolen. I’ve had friends robbed coming out of bars… friendly, pleasant people who want to appreciate and learn about the culture here. This country is still under the power of ………. and he is …… I’m so afraid to mention anything about him even on a blog post like this because……. but on the whole, there some amazing places as you say like Mana pools… you’re so lucky to have gotten to visit there. It is a beautiful and peaceful country but it’s not supporting itself when once it was the bread basket of Africa and now relies on the handouts of other Western governments. As nice as it is here it could be a lot better. But as a holiday destination, it’s awesome. I left in 2004 and lived in 23 countries between then and 2011 when I returned to Zim. I’m here now but planning to go somewhere a bit more civilized. Somewhere more “civilised”? Really? *sigh* Spoken like a true Rhodesian… P.S. Don’t bother coming back if you’re after the “glory days” before 1980 because those, my good sir, are well and truely over. Thank you for the lovely piece Annabel, so happy you enjoyed it! Perhaps you should add, as a bonus, myth that Africa is “uncivilised”? I guess petty thieving can and does happen anywhere. I had my bag stolen where I live in Noosa, Australia because I left it on the beach while I went surfing. Such a classic mistake and I did it because there were no valuables in it but still my car keys were taken so I got stuck at the beach and had to buy a new set for $250! There is definitely huge room for improvement in Zimbabwe and I know everyone is frustrated with the economy, living standards and more. Love that you show here just how people avoid talking about politics too. Great to see you here too. Sorry Archie’s wording sounded bad to you – I understand why but hope it wasn’t meant as a slur. I put my foot in it a lot and say things that come out all wrong. Can I just correct you on two things you pointed out there, unfortunately or rather fortunately there is no more coalition government buried after the 31st of July election. Secondly that woman she is not a nurse she is an ice-cream vendor for a dairy company behind the rainbow towers, that’s their uniform. Besides these two facts your article is good for the image of Zimbabawe. It is very safe I agree and tourists will find it’s an amazing travel destination. You absolutely can, thank you. That’s funny about the ice-cream uniform. I did see a few women wearing it and was wondering where the hospital was!